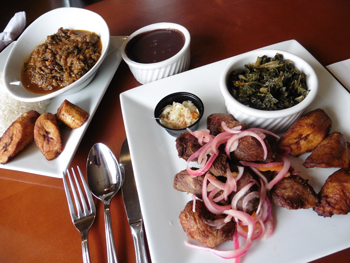 Haiti’s distinctive dish called Legume is at left, with fried plantains. At right, Griot with pikliz slaw and collard greens. Sharp-eyed drivers on Monroe Road might have noticed a new sign sprouting from a long-empty Korean restaurant: Island Hub. Go inside to discover Charlotte’s first Haitian eatery. Haitian-born Bernadette and Solon Jean-Francois met and married in New York, then moved to Charlotte about 15 years ago. 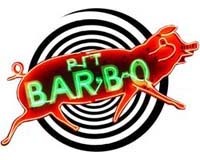 Their food will remind you of Cuban and other Caribbean cuisines but with distinctive twists. Griot — pork chunks are marinated in citrus and peppers, then flash-fried. Often comes with a small side of pikliz, a Haitian spicy slaw. Legume — spinach, eggplant and a vegetable called chayote are braised, pounded together in the cooking pot, then simmered with chunks of tender beef. As an island nation, Haiti has a vibrant seafood tradition. Try lambi — the Caribbean shellfish also known as conch — in a slightly spicy golden gravy. Or a whole red snapper strewn with onions and sweet red pepper, then pan-seared in a light tomato sauce. They’re not always available, and cooking can take a while, but worth the wait. For sides get some sweet fried plantains. And don’t miss Charlotte’s most savory collard greens. Solon loves music (he plays bass), so there’s usually kompa on the sound-system. That’s Haiti’s smoother relative of reggae, influenced by bouncy African pop. Weekends you’ll find live jazz and poetry or dancing to a Caribbean DJ. 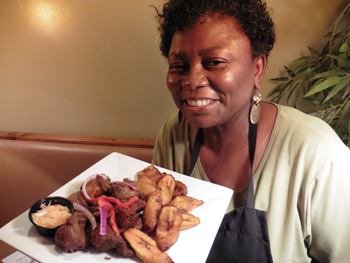 Bernadette Jean-Francois shows off Griot, Haiti’s dish of fried pork chunks with pikliz slaw. 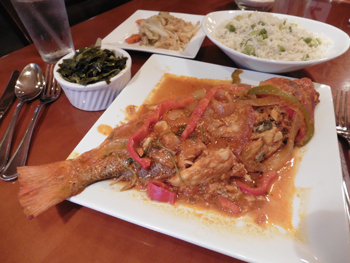 Haitian style whole red snapper, pan seared with sweet red peppers, onions and a light tomato sauce.